Since COVERGIRL has changed their look and all of their makeup has undergone a revolution, they have come out with a bunch of new products. Today I'd like to review one of their new mascaras, Exhibitionist Mascara. It comes in two shades, Black and Very Black. This mascara is known for having great results with testers seeing 90% liking the results they saw and 4 out of 5 people saw longer, thicker lashes after using this mascara. 8 out of 10 said the formula defines, lengthens and separates lashes. With this mascara lashes are full and defined after only one coat. This volumizing mascara formula glides smoothly onto lashes. Get soft lashes with no flaking or smudging. Lashes curl from root to tip. This mascara is also clump-proof. Ophthalmologist tested. Safe for contact lens wearers and for sensitive eyes. I like how this mascara lengthens and defines my lashes without making them clump. It also lets you add extra layers of mascara without clumping. The mascara doesn't smudge and helps curl the lashes nicely. It is an all around nice mascara without breaking the bank. It even goes on the lower lashes nicely without adding lots of mascara on them. My eyelashes are practically invisible so this mascara does a great job of helping to make them look good without being too much. 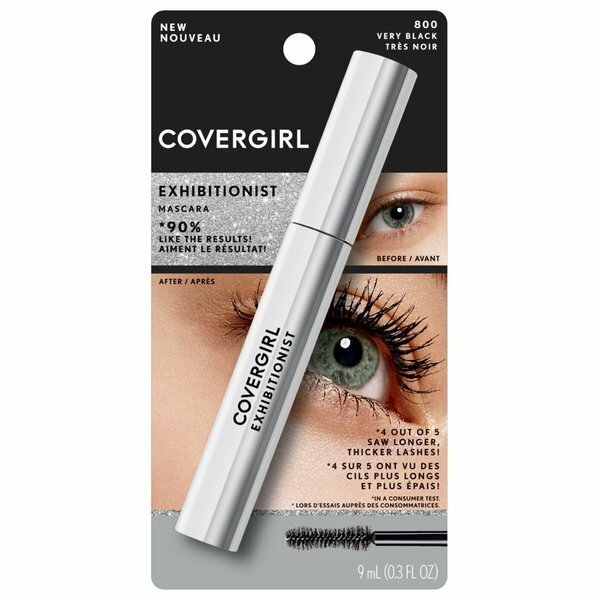 COVERGIRL Exhibitionist Mascara is available at mass market retailers such as Walgreens, CVS, Rite-Aid, Walmart, Target and Ulta as well as www.ulta.com. It retails for $7.99. Like COVERGIRL on Facebook: https://www.facebook.com/covergirl; Follow COVERGIRL on Twitter: @covergirl; Follow COVERGIRL on Pinterest: https://www.pinterest.com/covergirlxo/; Subscribe to COVERGIRL on YouTube: https://www.youtube.com/user/CoverGirl; Follow COVERGIRL on Instagram: https://instagram.com/covergirl/; Follow COVERGIRL on Tumblr: http://covergirl.tumblr.com/; Follow COVERGIRL on Vine: https://vine.co/u/907771872836456448, Follow @COVERGIRLXO on Snapchat and Follow COVERGIRL on Google+: https://plus.google.com/+covergirl/videos.